GERMAN-electric cars continue to strive to overcome the biggest obstacle they face the mileage. Research and experiment works when Audi A2 electric current mileage record. Of the many electric cars are tested not many of those cars that achieve mileage rational. Tesla Roadster mileage example which only reached 244 kilometers. This distance is better than other electric cars like the Mini E Volt, which only reached the mileage of less than 200 kilometers. From there, do not be surprised if many observers are pessimistic about electric cars can be an alternative energy solution. Pessimism so many people who actually prefer hybrid cars than electric. But these doubts would be erased when the Audi A2 Lekker managed to score a fantastic record for the farthest distance for electric cars. The car is yellow and purple are managed through a distance of 300km before the battery is recharged in the vehicle. Known, the Audi A2 Lekker distance from southern Germany to Berlin. Terrible when arrived in Berlin, The car still has the power to continue the journey. 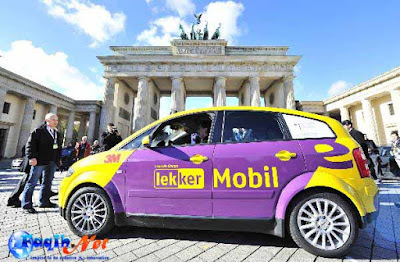 "If any journalist who wants to recharge his cell phone, please use this car, we still have power left over," said Mirko Hanneman, driver Lekker Audi A2. This success was made Minister of Economy of Germany, Rainer Bruederle proud. Because, as noted above, many electric cars which only managed a distance of 60-70 miles one way. "So this is really a leap of technology that truly remarkable. In addition, what makes me happy is German technology which could make it all come true," he said. What do Audi A2 Lekker is enough to make the electric car critics by surprise. Therefore, the Audi A2 Lekker actually break some things that are considered difficult to realize the farthest distance. For example, Mirko Hanneman brought this car with an average speed of 90 kilometers per hour. When the test took place where the cold weather conditions, Mirko Hanneman still run heating. But it is precisely not to make the Audi A2 Lekker failed record.